This year we have lots of new gifts to choose from, as well as some of our classic presents and Christmas cards. Our Christmas collection also includes a great range of personalised gifts and cards, so you can create something truly unique. This year’s Christmas Gift Guide is fully interactive! If you see something you like, simply click on it to go straight to the product on our website. Click the image below to view the gift guide now. You can see the full Christmas range here. We have fantastic new Keyrings, which make great small gifts for your pupils. You can even personalise your keyrings with your own festive message. Are you looking for a quick and easy way to wish your pupils a Merry Christmas? Take a look at our new range of Christmas Postcards. There are also Personalised Christmas Badges to choose from – your pupils will wear them with pride! Finally, take a look at our brand-new Christmas Pencils which have a special seasonal message. Are you looking for a special gift for your teacher? Check out our Personalised Keyrings and Notepads. Or, if they like a cup of coffee at break-time, they’ll love one of our Festive Mugs. If you’re looking for a stocking filler or Secret Santa gift for the teacher in your life, or a colleague, take a look at our brilliant ‘Trust Me, I’m a Teacher’ Mug and our Teacher’s Notepad. The great Sticker Starter Box is perfect for Secret Santa – even better, it’s on offer until 21st December! We’ve got lots of special and low-cost Christmas treats for your pupils. Your learners will love writing Christmas stories with our Christmas Notepads and Pencils, both of which come with a special Christmas message. Looking for something extra-special? Take a look at our Merry Christmas from Your Teacher Mug or our Smencils scented pencils. We have a fantastic range of Personalised Christmas Gifts for you to choose from. You can create your own Christmas Stickers and Stampers, as well as Magnets and Keyrings. They add a lovely personal touch to your Christmas Gifts. All of our Christmas Cards can be personalised with your own wording on the inside and outside. Some cards allow you to add your own photographs to make them even more unique. Make sure you take a look at our great range of Mr Men and Little Miss Christmas Cards. 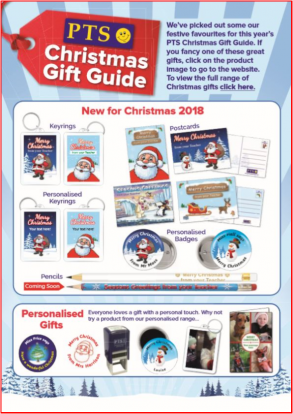 You can find all of these great gifts in our PTS Christmas Gift Guide 2018. Don’t forget, you can view the full Christmas range on the website here. No doubt you’re already planning what to do with your class this Christmas. If you’re struggling for ideas, take a look at some of ours! We’ve come up with great ideas for activities, displays, educational films and pupil gifts to help you get ready for Christmas. We have an abundance of new products at PTS this Winter, and lots more coming soon! Take a look at our latest releases and what to keep an eye out for on the website. Growth Mindset is increasing in popularity in UK schools. Do you already encourage a Growth Mindset in your classroom? Or, are you thinking about introducing this great concept to your pupils? Take a look at our brilliant new Infographic to find out how to quickly get started with your class.